Longitudinal waves are made up of compressions and refractions this can be demonstrated by pushing and pulling on a slinky each sharp push off the slinky will result in a compression wave travelling along the stretched slinky. An example of a longitudinal wave would be sound. 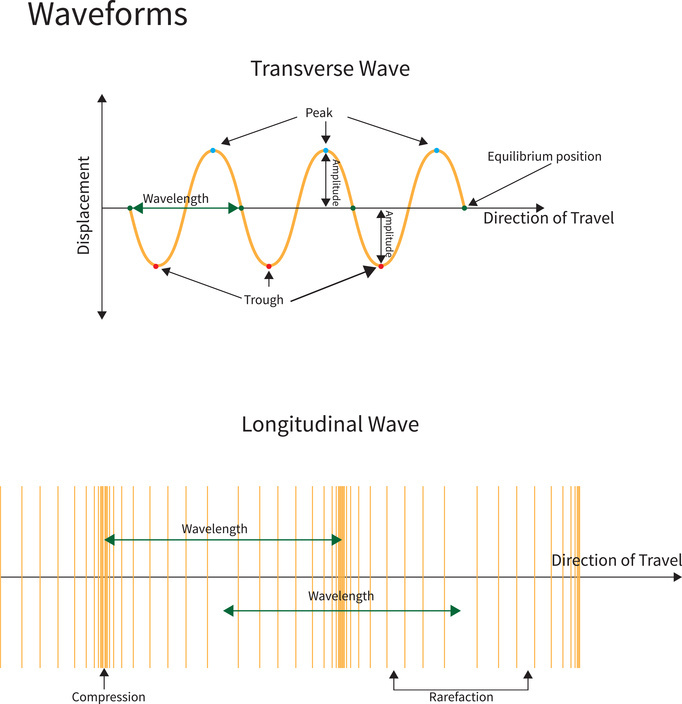 Transverse waves vibrate at right angles to the direction of energy transfer as shown in the image at the top of the page, for any wave the amplitude is the height of the wave crest or the depth of the wave trough from the position at rest or equilibrium position. The greater the amplitude the more energy the wave is carrying. Wavelength is the distance from one crest to the next or from one trough to the next. The frequency of a wave is measured by counting how many wave crests or troughs(pick one or the other)pass a single point in one second. The unit of frequency is Hz (hertz) and this is equivalent to waves per second.